Yuet Fong Hom listened to the presentaton. Nine wary residents gathered around a table in the basement of Boston’s Kenmore Abbey Apartments to broach a subject most people tend to avoid: death. The residents — all Chinese-born men and women between 64 and 85 years old — sipped hot green tea. 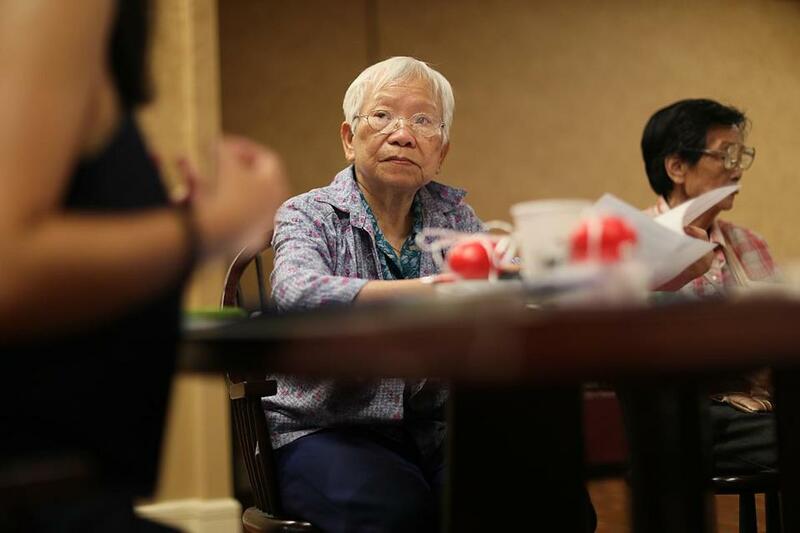 They listened poker-faced as a facilitator, Shiyun “Cici” Guan of the nonprofit Boston Senior Home Care, spoke in Cantonese about the need to designate a family member as a proxy to make health care decisions for them in the event of emergency or serious illness. At first, the room was so quiet you could hear the air conditioner hum. But when Guan and home care nurse Mary Jer passed out specialized playing card -- designed to get the seniors talking about what they think will be most important at the end of their lives -- the ice broke and the conversation flowed freely. The Heart to Heart Cafe, one of the first events of its kind on the East Coast, was underway. The end-of-life talk was candid, deeply felt, and animated. Because death is considered a taboo subject in Chinese culture — the numbers 4 and 14, which sound similar to the word for death, are omitted from floor schemes in Chinese buildings — many immigrants resist discussing it, for fear of bringing bad luck. Their American-born children often shy away from asking about their end-of-life wishes, such as if they would prefer to die at home or whether they would want to be kept on life support if they are incapacitated. The reluctance to pose such questions stems in part from the Confucian concept of “filial piety,” the importance of respecting, obeying, and caring for parents, said Angie Liou, executive director of the Asian Community Development Corporation in Boston, a community activist who isn’t involved in the Heart to Heart program. If the parents seem determined to sidestep the sensitive topic, the children will be loath to upset them. Chinese immigrants make up a quarter of the older population receiving home health services from Boston Senior Home Care. So in March, project coordinator Guan and chief strategy officer Alicia Gomez traveled to Milpitas, Calif., to visit the Chinese American Coalition for Compassionate Care, which developed the Heart to Heart Café to spark conversations in the West Coast Chinese community. There they received training on how to run the program and bring it to Boston. Boston Senior Home Care has long worked with seniors of all backgrounds on filling out state documents, including health care proxies and medical orders for life-sustaining treatments. 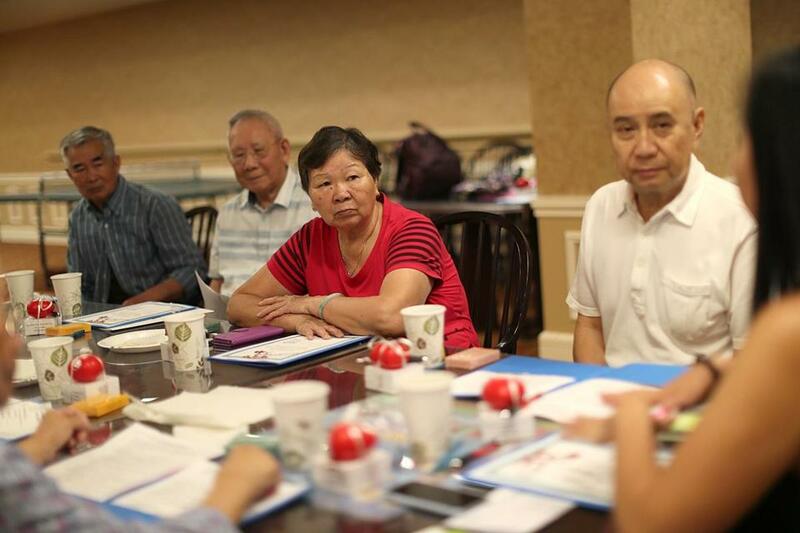 While the Heart to Heart program was tailored to the Chinese community, the home health provider plans to roll out variations of it to encourage end-of-life discussions for English-speaking seniors and other communities it serves. Members of the Chinese community acknowledge their cultural taboo can pose unique challenges. Leverett Wing, executive director of Commonwealth Seminar, a Boston organization that seeks to open the doors of government to underserved communities, recalled a story from his childhood. His mother warned him not to ask an elderly cook in the family’s Chinese restaurant in Chelsea how old he was. “She told me he thought the gods had forgotten him, and if I mentioned his age they would hear it and say it was time to bring him home,” Wing said. In many ways, the traditional Chinese aversion to end-of-life talk isn’t much different from that of other cultures, said Kate DeBartolo, director of the Boston-based Conversation Project. The project encourages families to “have the talk” about death. It also urges advanced care planning for older adults while they’re still healthy: expressing their wishes to family members, completing wills and getting financial affairs in order, and instructing nurses and emergency responders on whether they would want to receive cardio-pulmonary resuscitation or be put on a ventilator if their heart or breathing stops. 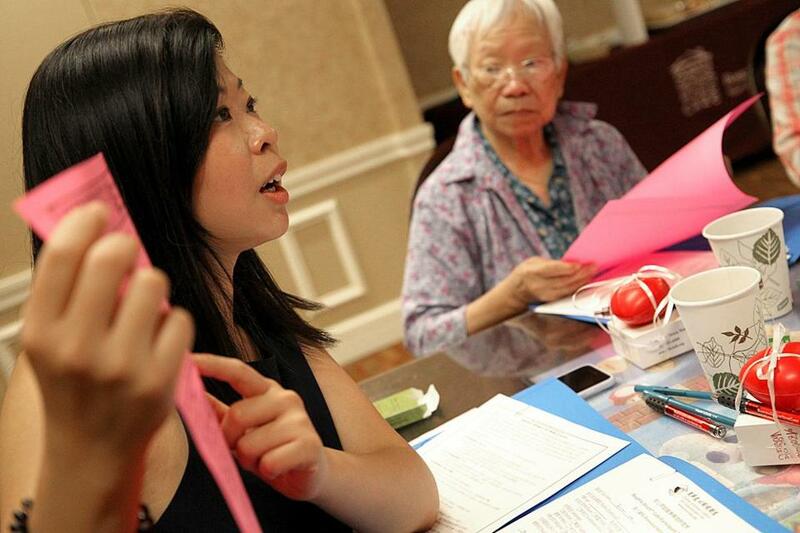 Shiyun Guan led a group of seniors in Boston in talks on dying, a taboo topic in Chinese culture. The 6-year-old Conversation Project supports the Heart to Heart program developed by the Chinese American coalition in California. The project also works with other ethnic groups from Portuguese to Haitian Creole and religious faiths from Baptists to Buddhists. While more of them are embracing its cause, the project still encounters resistance from many quarters. Conversation Project officials think the tide is turning. Their “conversation starter kits” have been downloaded over 300,ooo times and used by more than a million people, they estimate. Members of the Chinese community are among the most receptive. To attract the Kenmore Abbey residents to the Heart to Heart Café last week, the Boston Senior Home Care team offered incentives: sweet egg tarts and other pastries Guan brought from a Chinatown bakery and small gift packages of memo pads and heart-shaped stress balls tied together with white ribbons. They’d laid the groundwork in an earlier session that focused on health care proxies and medical directives. They plan a follow-up session, likely in the evening, with the residents’ children. I want to maintain my dignity. I’d like a room with windows. If I’m going to die anyway, I don’t want to be kept alive by machines. I want to take care of unfinished business. Don’t cry while I am dying or around my body after I die. Guan asked the residents to pick three cards from each suit — clubs for social needs, diamonds for financial, spades for physical, and hearts for spiritual — that best expressed their wishes. Then she asked them to pick the three most important to them overall. Family figured prominently in the wishes they expressed. Some talked tentatively about their own needs in their last days, but more passionately about those who will survive them. At the Kenmore Abbey Apartments, residents and staff gathered for a Heart to Heart Café on the issues of aging.